The slick boxing Trout did what he was supposed to do. In front of 40,000 plus fans at the Alamodome, San Antonio, Texas, he controlled the distance and pace with his jab. He mixed it up, going often to the body. He threw more punches, displayed better combination punching, but he still lost the fight! How could that happen? It happened because Saul “Canelo” Alvarez impressed a lot of people, including the judges, that he’s a pretty damn good defensive fighter as well as an aggressive one. Several times, Trout ripped off four and five punch combinations, and none landed. 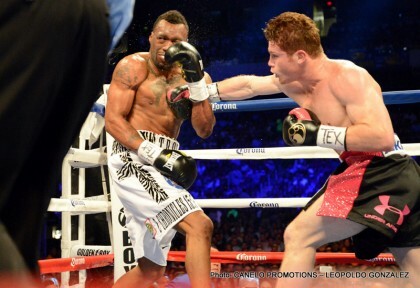 Then, just enough times, Canelo would land one of his sharper, more powerful shots. When his shots landed, they had an obvious effect on Trout, and would shake him from his shoe laces to the sweat on his brow. One particularly impressive shot occurred early into the seventh round. Trout carelessly threw out a rather soft jab from his southpaw stance, and Canelo followed it back with a sharp, straight right. Canelo’s punch landed right on the chin. It took Trout’s body a fraction of a second to react, but once it did, it resulted in an awkward little dance, which ended with “No Doubt” on the canvas. Amazingly, Trout survived the punch, and actually came back strong, maybe even enough to turn a 10-8 round into an even one? It was a significant example of the way the whole fight transpired. The pattern (without the actual knockdowns) was repeated often enough to convince the judges that even though Trout was throwing more and trying hard to control distance and pace, he just wasn’t landing the telling blows. Canelo was. Canelo fought smart. He kept his poise, avoided getting wild and over-extending. Seldom was he out of position, which kept Trout from having opportunities to land clean counters. Neither man was marked up much. There were a few bruises here and there, but overall the fight was much more of a technical match-up than a slugfest. But, there was plenty of action too, and Referee Laurence Cole seldom had to get involved. Probably the biggest surprise to come out of the fight was Canelo’s demonstration of how well he moves his head and feet. He surprised more than a few people, including Austin Trout, that he can be as elusive as needed. For such a young (but experienced) fighter, he also is very mindful of proper distance. He senses what to do when in the danger zone. If he’s out of position and can’t land his own shots, he slips, slides and rolls with his opponent’s punches, just like the best of them. So, Canelo got the revenge he was looking, avenging Trout’s victory over his brother. More important, he picked up both the WBA and WBC world super welterweight title belts. He reinforced his star quality. In fact, he bumped it up a notch or two. His drawing power equals just about any fighter out there, and it will be tough for anyone, including Mayweather, to avoid facing him. It’s hard to believe he’s only 22 yrs old!